A little over 33 years ago, February 10, 1971 to be exact, an article appeared in The Republic concerning the revitalization of the downtown area, and a building that some wished could be saved. 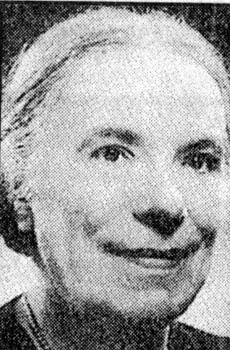 G. Chester Kitzinger penned the article for the paper. Mr. Kitzinger's life will be looked at in more detail in the future, but for the moment, here is the newspaper article in its entirety. Any pictures included on this page came from my collection, and were not included in the original Republic article. The man standing in the middle is G. Chester Kitzinger, Band Director of Columbus High School. This picture is from a Columbus High School Log, date uncertain as I type this. Editor's Note: This article about the Schwartzkopf Opera House, which was in one of the Jackson Street buildings to be razed, is one of a series which The Republic will publish this year in observance of the county and city sesquicentenial. The article was written by G. Chester Kitzinger, 1601 Washington Street, at suggestion of Robert J. Marshall, editor of The Republic, who had questioned Mr. Kitzinger about the opera and learned he was collecting information on the opera and hoped the building might be spared. Yes, there is still an old opera house building on the west side of Jackson Street opposite the Bartholomew County Courthouse, but not for long, I fear, and it is surprising how few residents know of its existence. 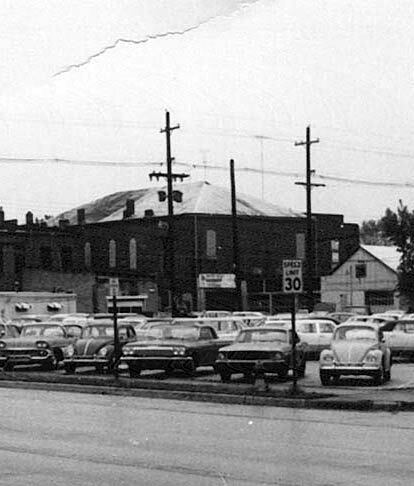 It is the old Schwartzkopf Opera House, immediately north of the Carrico furniture store in the to-be-razed Redevelopment area. The Opera House itself was on the second floor above the former location of Wilson Olds-Cadillac agency and was in its hey-day in the years 1880 through 1900. The Klondike Saloon was below. That was long ago, but some do remember. Ike Frohman of Frohman's Ready-to-Wear tells me that he not only remembers the Opera House, but took part in a road show there. He figures it was about 1894, and he was nine years old at the time. The road show was "The Count Of Monte Cristo" and some young boys were needed to make the ocean waves. As he explained it, the boys lay down on the stage, were covered with a large canvas and then kept moving their arms to make the waves effect. There was a large replica of a boat on the stage and to keep the boat from tipping over as the Count walked the deck, there were sandbags on one side. While the Count was parading the deck, shouting and swinging his sword, one of the sandbags toppled from the boat and hit Ike on the head. Ike has cause to remember the performance but the theater thereupon lost a promising young actor. I also asked Frank Quick, 1804 Central Avenue, who is 92 years old, if he had ever been in the old opera house and I got another suprise. He also remembers being in a play there--in 1887, also at the age of nine. It was given by the Tabernacle Christian Church and was based on the Mother Goose Rhymes. Frank doesn't recall who played King Cole, but he, Kent Cooper (who later developed the Associated Press) and Joe Sweeney were the "Fiddler's Three." Milton Reeves played the part of a little crying boy and Frank also recalls that M. O. Reeves, John I. Cobb, and W. J. Beck were three of the members in a male quartet. As a youngster, I played all around the Tipton Knoll area and the Opera House and Crump Theatre and remember them unloading scenery for the road shows. The Schwartzkopf Opera House was one of at least five theaters which existed in Columbus prior to the Crump Theatre on 3rd Street and played an important role in the lives of the city's residents in the later part of the 19th Century. The historic, 2-story brick building which housed the opera with the saloon below is scheduled for razing in the near future as part of redevelopment, but instead, would it not be possible to restore the building, again using it as a theater, possibly for Arts Guild productions and other events? The last road shows were presented in the opera building around 1903, but home talent shows were held there as late as the start of the 1920's. J. G. Schwartzkopf, founder of the opera house which bore his name, came to Columbus in 1859 and started a wagon factory on Jackson Street. He was born July 27, 1835 in Wissgoldingen, Germany, and came to the United States in 1851. He went from Cincinnati to Newbern and then to Taylorsville before coming to Columbus. He died February 10, 1909, in his mansion-like home on Tipton Knoll, then called Schwartzkopf Hill, which was cut through to install the new 3rd Street bridge over White Water. Leading up to the story of the "Opera House," it is best perhaps to recall the few places or means our hardy ancestors had for entertainment and amusement--no television, radio, movies nor tapes and stereo recordings. Among the city's earliest capitalists was Isham Keith, who came to Columbus in 1854 and opened a dry goods store at the northwest corner of 3rd and Washington streets. Two of his sons, John and Squire Isham, enlisted in the Army for Civil War service in 1861 and a year later, the son Isham was killed and his name honored through the Isham Keith post of the G. A. R. A large monument in his memory stands at the 16th Street entrance to the City Cemetery. John Keith, who was an attorney, returned to Columbus in 1865 and put up his own building at the southeast corner of 3rd and Washington streets, with Keith's Hall as a theater above. The Theater continued until 1880, the building later becoming the location of J. G. Schwartzkopf Hardware store, and now housing the Irwin Management offices. The late Laura Long in one of her "Horse and Buggy Days" column in the Evening Republican, now The Republic, wrote: "George Schwartzkopf came to America from Germany at age 17 to escape military training." My grandfather, George Kitzinger, came to America from Baden Germany at the same age for the same reason and about the same time. He came in 1854. It is a coincidence that the Keith brothers also came to Columbus in 1854. In a Columbus City Directory belonging to my family and published in 1865, the population of Columbus (Indiana) for the 1860 census was given as 1,840 persons and the business of George Schwartzkopf had added a blacksmith shop to his business. His full name was John George Schwartzkopf. The late William Marsh (Will Marsh) in his book, "I Discover Columbus," wrote: "About 1880 Schwartzkopf, now becoming wealthy, put up his building on Jackson Street with a saloon downstairs in the north room and the Opera House above--a flat floor with loose chairs, but a regular stage, dressing rooms and box seats on both sides of the stage." But articles in the Republican issues of those years indicate the building was erected prior to 1880 and that in that year--1880--a theater hall in the second story was remodeled and "refitted" into a first class opera house. On March 10, 1880, the Republican reported: "Mr. George Schwartzkopf returned from Indianapolis yesterday, bringing with him from Buber and Miller, the architect's plans of the Park Theater stage in Indianapolis. This stage (for the Schwartzkopf Opera House) will be in accordance with theirs, except smaller in scale. The stage will be 30 feet deep instead of 40, will have six wings instead of nine. Dressing rooms will be below. There will be an orchestra pit with railing and an entrance under the stage. Also a box seating four persons on each side of the stage." Opening night came Friday evening, November 19, 1880, featuring John Thompson, comedian. "See the new hall, the new scenery and a first class play," urged an advertisement in the Republican. The next night, the Republican reported on the opening play and referred to the "refitted" hall, indicating there had been a remodeling with much improvement of facilities although the reporter felt the program perhaps left a little to be desired. Another article in the same issue commented on the women's hats worn on opening night and was headlined "A Chapter Of Complaints." The article read: "The opening of the Opera House last night rendered several things very prominent which had not been noticed before. One was the new style of hats which the dear creatures now effect. It clearly resembles the kind the Chinese gentlemen wear in geography pictures, or again, a small umbrella trimmed awkwardly sweet and minus handle. One of these hat four seats in front of you eclipses the whole stage so that the drop curtain is an unnecessary ornament and makes the average play-goer at least think--if he does not utter--comment on that hat which it would be injudicious to repeat at a prayer meeting. Many persons made comment about the hat in front of them that would horrify the unconscious wearer should she hear them. The hats will still be worn, however, but they are not conducive or religious thought. Then there was the nuisance of a large part of the audience leaving the hall in a great rustle during the performance of the last scene." 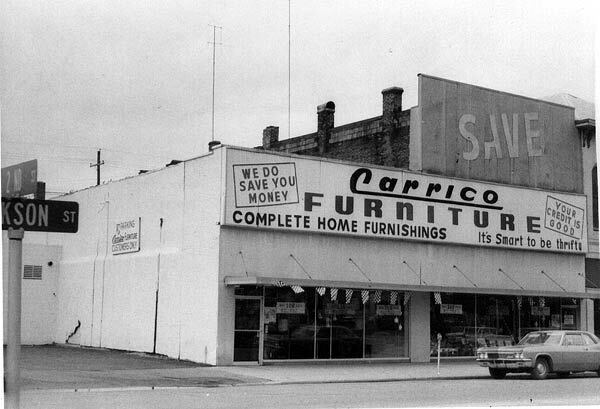 I am almost certain that Schwartzkopf started his wagon-making business in 1859 in a smaller building, possibly the building now occupied by Carrico Furniture. The Opera House on the north side was formerly reached by a stairway from Jackson Street, but this has been closed off and it now can be reached only through the upper part of the Carrico store. The Saloon was below in the area formerly used by Wilson-Olds Cadillac. The upper part of the Carrico store was once used by the late Reverend George Hobson for his church work for the poor, and many dinners for the needy served there. For a munber of years, the lower floor of the Carrico building was occupied by Benefield Brothers Machine Shop, auto garage and sales, among the first auto businesses in the city, if not the first. Today, there appears to be no remnant of the opera furnishings in the old hall, but when I visited the theater some 30 years ago, the stage was still there, the back curtain, the boxes and billboards with names of Bill Darber, Clara Belle, L. P. Duckworth and John Mazango, well-known actors in their day. Will Marsh mentioned all of these in his "I Discover Columbus," along with William Mitchell. But Mitchell was my uncle by marriage and only helped with the scenery. November 24, 1880: "Hi Henry's Premium Minstrels, second to none. A host of attractions, 20 star artists, six superb clog dancers, special vocal quartet. 35 and 50 cents." November 29, 1880: "Columbus Opera House Wednesday evening. Oliver Doud Byron, who will appear in his world-wide renouned play, "Across The Continent." with miss Kate Byron, and ensemble of 20 artists, who will introduce his old Cremona and Hi Wang Wee. 50 and 75 cents." December 7, 1880: "Opera House. The Jolly Pathfinder in the oddity, "Scraps," and the incomparible English Comediette, entitled "Perfection." 50 cents, Gallery, 35 cents (here is a reference to a gallery)." It is important that we mention the other theaters, along with the old Opera House, which our prominent citizens believed were so necessary. William Marsh made a statement in his book with which I disagree. I quote: "Years before my time, we always had Opera Houses with a stage where drama could be put on, evidently profitably, as there were always two or three owned by men who put profit above civic pride." Well, our citizens who built and provided places of amusement were men of great civic pride, Schwartzkopf, Crump, and Keith. They helped start Columbus on its way. We have mentioned Schwartzkopf's and Keith's Hall. Then in 1889, John S. Crump built the Crump Theatre. The new Crump Theatre, a well equipped opera house, was able to stage any show and many New York productions have appeared at the Crump. The next theater was provided by Francis Crump I, a similar layout as Crump's hall, northeast corner of 4th and Washington, later a drug store location. The theater was a poor investment and was destroyed by fire. Next was the more pretentious Palace Theatre, a part of the first St. Denis Hotel, occupying the second floor and with a front entrance. It burned in 1883. There might have been a sixth theater, but it never got beyond the talking stage. Frank Crump II planned a theater in 1884. Instead, he put up the building at the southwest corner of 6th and Washington. January 17: Opera House. One Night Only. The original and only Billy Arlington Minstrels, founder of Mayer's Opera House in Chicago, 20 artists of merit. January 20: Circus Toni Denier's production of the Artistic Conspiracy Humpty-Dumpty, Pantomime Troupe. January 26: The great and only Anthony and Ellis production, Uncle Tom's Cabin. Appearance of the petite and favorite actress Minnie Foster. The Memphis University students. Our imported Siberian Bloodhounds. February 2: Sprogue's Original Georgie Minstrels. 18 colored stars, six bass end men and four song and dance teams. Also in the February 2, 1881 Republican was an advertisement for J. G. Schwartzkopf Hardware, Stoves and Tinware at Keith's old theater stand, 235 Washington Street. I mentioned previously that Schwartzkopf bought this building at about that time. Later presentations at the Opera House included "The Banker's Daughter," Alex Coufman as Eugene Larare in the emotional drama "A Life's Mistake," Nera Vernon, America's famous singing soubrette in an entirely new version of "The Hidden Hand," with the great cotton picking scene; Hazel Kirk with the Madison Square Theater Company; "Rip Van Winkle"; R. L. Scott and Harry Mills in "Chip O' The Old Block," and Duncan Clark's "Female Minstrels, American history truthfully and picturesquely illustrated by living statuary. 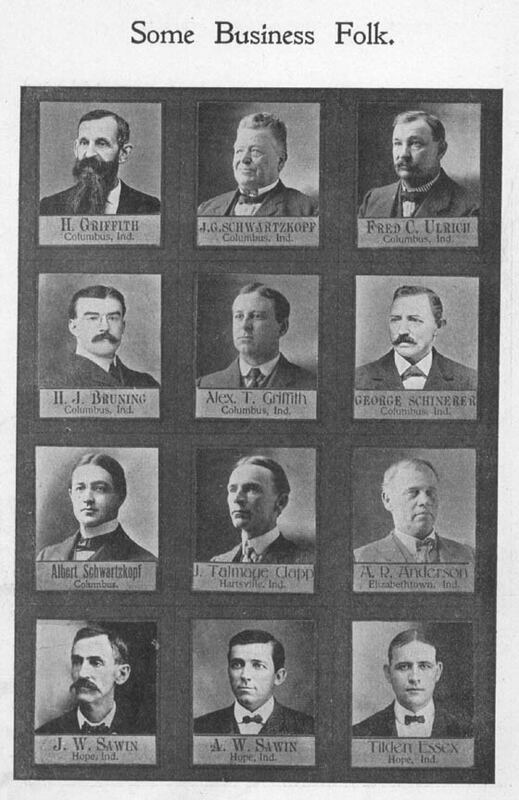 These are but a handful from the many advertisements in the Republican 1880-1889. Prices continued to range from 25 to 50 cents for most of the shows. The plays were briefly reviewed in the paper and as one does research of this type, requiring much patience, the researcher realizes what a great role newspapers play in recording all this information, day by day through the years. Schwartzkopf Opera House, as most theaters of its type, was not only for road shows, but also was used for home talent productions, public meetings, and other special events. Carlos Folger, west of Columbus, a former Columbus mayor and county official, recalls one of these "specials" when he was around five years old. It was about 1890 in the days of the large singing groups and the Salvation Army bands. It was custom of the Thomas Folger family to attend services each Sunday at Mt. Pleasant Christian Church and often to invite the Pastor, the Reverend W. H. Baker to Sunday dinner. On this particular Sunday afternoon, the Rev. Baker suggested they attend the meeting being held by the Salvation Army with churches of all denominations at the Opera House. 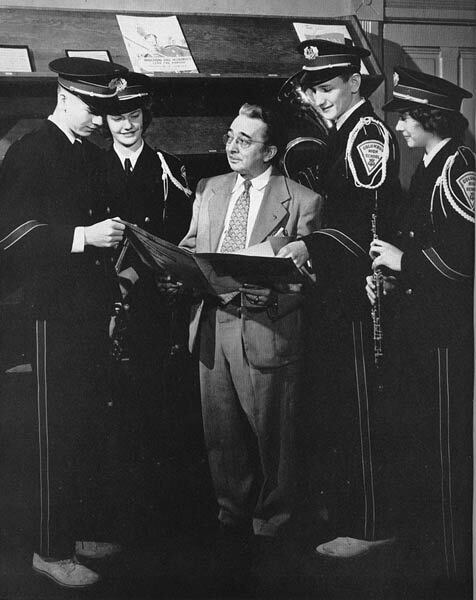 The Opera House was packed and after a rousing round of speeches and hymns, the Salvation Army minister suggested all go downstairs, place the bass drum on the sidewalk and everybody toss his silver coins on the drum head to see how much it would hold before breaking. The coins became donations. In his book, Will Marsh wrote: "When I was six to ten years old, the favorite shows at the Opera House were for kids only. Tickets would be handed out at school and for ten cents, you would see a grand exhibition of magic with a prize awarded some lucky kid whom we would vote on. Once we voted the prize to a very poor boy, Willie Storms, son of a Civil War hero. Thirty years later, Willie became public relations man for Sir Malcolm Campbell. One of the shows for kids was the first exhibit of the Edison phonograph in Columbus. Recordings were on round wax cylinders and for five cents, you were given two rubber hose tubes with earphones to hear the recordings." Probably the last home talent show at the Opera House, which had continued road shows even after the opening of Crump Theatre, was the "Cooties Frolic," produced by the American Legion in 1920. Ad advertisement in the Republican, May 15, 1920, announced that the music and athletic show would feature Miss Bernadine Niehaus, ballet dancer; Elise Munn Kitzinger and Ida Edenburn, sopranos, with Miss Louise Mason as accompanist, plus Joe Walters and Howard Wiggam, boxers, and other athletes of "proven ability." A motorcycle was to be given to the newsboy voted the most popular and young girls at the booths included Mary Lincoln, Mable Snyder, Frances Lewellen, Mary May, Marsia Morgan, Mary Gottschalk, Ruth Hull, Leneve Nicholson, Lois Pruitt, Mildred Boyer, Sarah Green, Ruth Huffer, Mary Mobley and Elizabeth Kitzinger. Will Marsh wrote that the era of road shows at the Opera House ended by 1903 or thereabouts with a company which was there several weeks under the name, "Mrs. Finnegan." There was a group of lively and pretty dancers and after the regular show--and for a small extra fee--Columbus had what may have been its first burlesque, strip-tease type show. I remember the building as it was in 1903, but do not recall any road shows there then. The Klondike Saloon was still in operation downstairs in 1904. The Benefiel Brothers machine shop was next door. The old Opera House did not have a phantom, but the neighborhood had its violence. A man seriously wounded his lover in an apartment in an upper floor of the building to the south and at least one man was wounded in a shooting in the saloon. And there was a robbery-murder outside the alley entrance to the saloon the night of August 13, 1904. I was visiting at the home of John Carr on 3rd Street as his young nephew, John McShane of Indianapolis, was there. We heard loud talking and people running. When we joined the crowd, we saw the body of a man lying in the grass at the Jackson Street side of the courthouse. The Republican reported the victim was Brice Burns, 75, near Grammar. He was hit over the ear, causing a broken neck. Five men were arrested and two stood trial. I attended part of the trial. But one wonders how much our ancestors accomplished so much and made the progress they did without our modern conveniences. I still have some hope that the old Opera House building might be saved--and restored with a theater on the first floor. As it is, the curtain is about to drop on the last act in the Old Opera House. There will be no "Hearts and Flowers" melody that brought tears to many when little Eva "went to Heaven." There will be no fast and loud "chaser" music (as it was called) when the show was over and the public exited. The only music will be the staccato notes of the wrecking hammer and the beat of the wrecking ball as walls crash with the sound of the drummer's cymbals. But the old Opera House did noble service to those early-day builders of Columbus, who went to the Opera House for an evening of relaxation and entertainment after a day's work with inconveniences few of us have experienced. There they saw all the moods, emotions, and experiences of the human race on stage and live. That's what an opera house is for. Downtown Pictures, 1966 CHS YearbookS! Prints You Can Purchase! Help Support This Website! Businesses Of Yesterday WHAT WE WATCHED Old Historic Columbus Indiana Website COLUMBUS LINKS!